The BMW 7 Series goes on sale from April 13 with recommended retail prices starting from €96,160. It boasts a striking newly refreshed exterior design at the front end that is now some 50mm taller at its foremost point. And BMW says the interior is similarly striking, and that it will have many customisable options and luxury features. The new 7 Series will feature the option of new engines in the line-up. These comprise petrol and diesel units, using six, eight and 12 cylinders. There will be a petrol electric hybrid that offers an extended electric-only range of up to 58kms. The 7 Series body structure comprises a material mix of high-strength steels, aluminium and carbon fibre-reinforced plastic (CFRP ). The carbon core used for the passenger cell makes a major contribution, not only to the high level of safety, but also to the handling capabilities. Depending on the model variant, the new BMW 7 Series comes as standard with18- inch light-alloy wheels. Inside, the new 7 Series models are equipped as standard with a hands-free phone system including wireless charging. LED ambient lighting with a choice of six colours is available as standard. The rear-seat entertainment system comprises two fully adjustable 10-inch full-HD displays complete with a Blu-ray player. The new BMW 7 Series also includes the latest version of the BMW Touch Command unit. This removable tablet with a seven-inch screen can be used from any seat and even outside the vehicle. 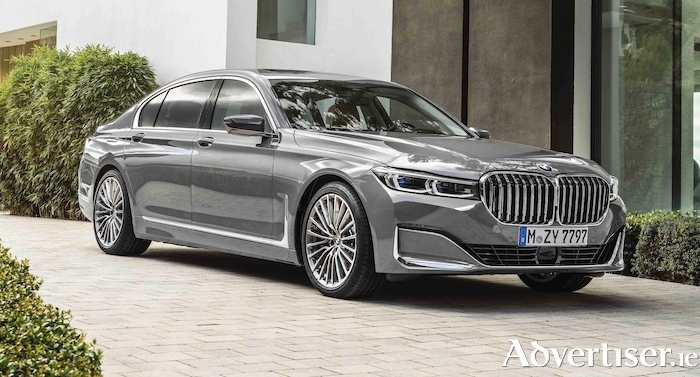 The new BMW 7 Series is available with petrol and diesel engines using six, eight and 12 cylinders, as well as a plug-in hybrid drive system offering an increased electric range, enhanced performance and lower consumption. The eight-speed Steptronic transmission, fitted as standard on all model variants, has also undergone further improvement, as has the BMW xDrive intelligent all-wheel-drive system that can be combined, not just with the petrol and diesel engines, but with the hybrid drive too. Spearheading the line-up of engines for the new BMW 7 Series is the 12-cylinder petrol engine. This 6.6-litre 585hp unit with a peak torque of 850Nm is used to power the BMW M760Li xDrive. Top speed is electronically limited to 250km/h. The benchmark zero to 100km/h sprint can be achieved in 3.8 seconds while CO2 emissions are provisionally 282g/km. The entry level petrol engine comes in the form of the BMW 740i and 740Li. With a power output of 340hp and a peak torque of 450Nm, the 740i and the 740Li accelerates from 5.5 and 5.6 seconds, respectively. The new plug-in hybrid drive technology enables the BMW 745e and BMW 745Le xDrive models to record zero to 100km/h times of between 5.3 and 5.1 seconds while achieving an electric-only range of between 50 and 58kms. The speed threshold for all-electric driving has also increased to 110km/h. The combined fuel consumption figures for the plug-in hybrid luxury versions are claimed to be between 2.2 and 2.6 l/100km. The CO2 emissions produced when burning fuel average between 48 and 52g/km. The new BMW 7 Series also offers a trio of 3.0-litre six-cylinder in-line diesel engines delivering 265hp with a peak torque of 620Nm. A latest-generation eight-speed Steptronic transmission is featured in the BMW xDrive all-wheel-drive versions while the BMW 745e and BMW 745Le xDrive are equipped with a hybrid-specific variant of the eight-speed Steptronic transmission. For the first time, the plug-in hybrid variants are available with the standard of an eight-speed Steptronic Sport transmission, offering even quicker gear changes and the benefit of shift paddles on the steering wheel. The launch control function is another feature of the eight-speed Steptronic Sport transmission, which comes as standard on the new BMW M760Li xDrive. The driver can use the 'driving experience control' switch buttons to select a set-up option to suit the situation and configure that set-up individually.